Well, it’s day three of The $35 Challenge and I have to say I’m a little…fatigued. 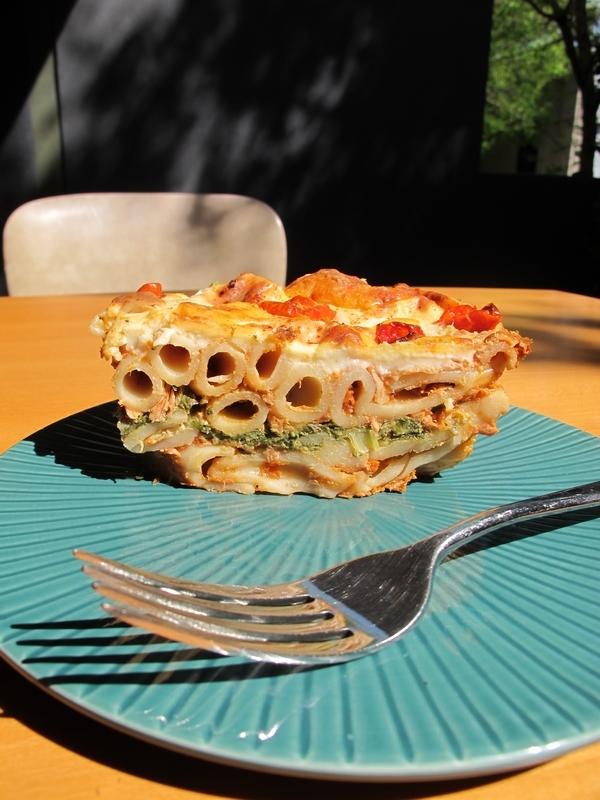 Last night’s dinner was an inspired but ultimately unimpressive pasta bake in four layers – a tomato-tuna-zuchini-garlic-penne layer, a spanikopita filling layer (half a portion), the pasta again and a layer of bechemal. It was fine, but it was 9:00pm by the time we ate it and I have to admit I was pretty over it by then. That’s a recipe which needs some work, maybe it’ll make an appearance here once it’s fixed. We’re eating a lot of veg, but we’re also eating a lot of carbs, more than usual. We started off with pizza, we’ve had three days of porridge breakfasts, and dinner leftovers for every lunch. To be honest, after all the veg we bought, I’m doing a worse job of cooking balanced meals than I expected. The big shop at Paddy’s Markets was relatively stress free; the two of us had $70, we’d spent $10 on pizza ingredients and bought a steak at the butcher, so we went into the markets with about $55 in our pockets. Putting aside $20 for the non-fruit-and-veg items (and inspired idea on the part of my beau), we roved the markets that Sunday arvo and we were ruthless. Brocollini $3.50? Tell ‘em they’re dreaming. Hard tofu $2.30 for 500g? Well, silken firm is $3 for 900g, so that’s the one we’ll get. We came out with everything we were after (or substitutions) and money to spare. 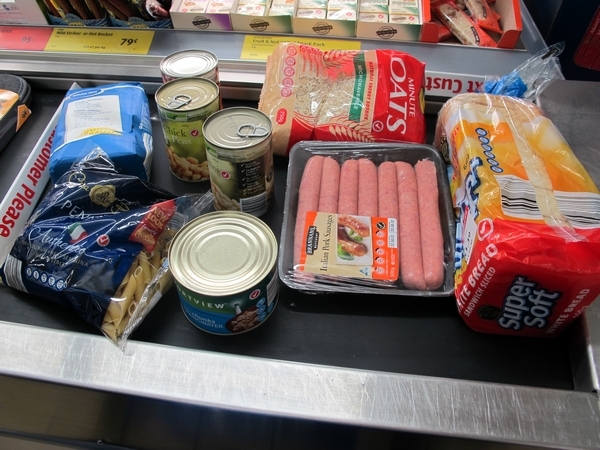 Our next stop was Aldi, where we planned to buy tinned beans, tuna, flour and pasta. At this point it was about 2pm and we were pretty damn hungry, so we decided we needed to make a lunch decision stat. We went with pork sausages at $2.99 for a pack and a discount loaf of fluffy white bread, to be served with salad. The whole bill came to only $11.50 for 9 items. I spent another $2.95 today for tinned tomatoes and milk. At 59 cents a tin for tomatoes and $1.19 for a litre of full cream milk, I did pause briefly and consider whether or not someone producing these goods could ever make a decent wage. But to be honest, on this budget, that kind of concern is a luxury we can’t afford. In total, we’ve spent $62.85. And when I look at the numbers on the receipts from Aldi, they are so so low. At an estimate those tomatoes and milk would’ve cost twice that price at my local IGA, and the quality would be no better. That raises another question – that of proximity to cheap food. It’s easy for me to walk the half hour to aldi and pick up a few things for my two person household. But what if you have kids? Or what if you live 50 ks from the nearest large market or supermarket? Or don’t have a car? Or there’s no public transport? It’s a lovely thought that we could all shop at local markets, but if I rock up to Eveleigh Farmer’s Market of a weekend, it’s unlikely I’ll be able feed my household for a week on less than $200. 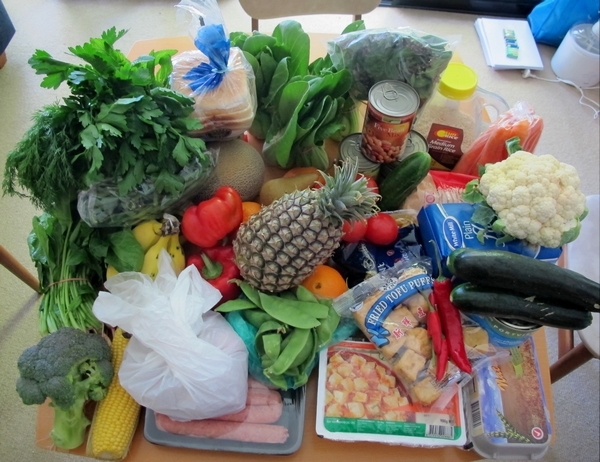 In the week prior to the challenge this year, our household (2 people) spent a total of $519 on food and drink. $519. On food and drink. Yes there was booze in there, but only eighty bucks. It’s an average daily household spend of $74, $37 per person per day. So basically, this week, we are spending less money of food in a week than we would usually spend in one day. It’s not too late to support The $35 Challenge. During Anti-Poverty Week, from October 14-20, you have $5 a day to spend on food. By experiencing poverty for just 7 days, we come to a better understanding of the realities and stresses of living in poverty. By blogging or tweeting this experience, we can raise awareness of an issue so often swept under the rug. And by donating the remainder of the money we would usually spend on food to Foodbank, we can make a real difference. For more info, click here.